Rhys McCabe is moving to the Showgrounds for the second half of the League of Ireland season. 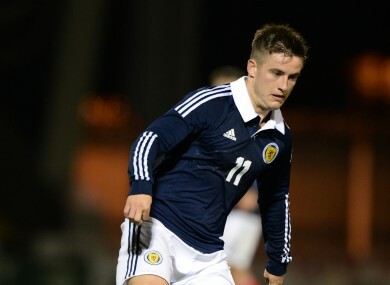 McCabe represented Scotland at U21 level. SLIGO ROVERS HAVE boosted their resources with the signing of former Rangers midfielder Rhys McCabe on a deal until the end of the season. The 24-year-old, who has also had spells with Sheffield Wednesday and Portsmouth, will move to the Showgrounds in July subject to international clearance. McCabe spent the last two seasons with Dunfermline and made 23 league appearances, scoring three goals, last term for the Scottish Championship side. A former Scottish U21 international, McCabe started his senior career at Rangers, where he featured nine times, before leaving Ibrox for Sheffield Wednesday in 2012. He spent three seasons at Hillsborough but found first-team opportunities hard to come by and had a loan spell with Portsmouth before his contract with Rangers expired at the end of the 2015 season. His arrival at Sligo is a shrewd bit of business by Bit O’Red boss Gerard Lyttle as he looks to reverse his side’s fortunes after a difficult first half to the campaign which saw them win just three times. Meanwhile, Bohemians have brought in striker Stephen Donnelly after he scored 24 goals for Usher Celtic in the AUL Premier A Division last season. The 24-year-old links up with Keith Long’s squad ahead of Bohs’ clash with St Pat’s on 16 June. Email “Sligo Rovers announce signing of former Rangers midfielder”. Feedback on “Sligo Rovers announce signing of former Rangers midfielder”.